It’s been a big week. Not for me, but for the many friends who called and emailed with huge happy news and devastatingly sad news. I’ve both cheered and cried with those friends, and now at the end of the week I’m feeling a little shell-shocked. How can so many big life things happen to so many in one little week? It gotten to the point I’ve started preemptively emailing a few people and asking if they’re ok. They must think I’m nuts. And then today, my local paper’s “horrorscope” said, Capricorn~ "In the immediate future, there is a strong likelihood of accidents taking place at home, especially related to fire and electricity. Be careful." After a good laugh, I started to think; maybe I should stay away from the stove, the grill, the smoker, the teakettle, and the fireplace and go make a margarita. So I did, just as the sun started to fall below the horizon. It was one of those fresh squeezed Texas types I spent the past several days “perfecting”. Making sure they all tasted exactly like the ones I enjoyed two weeks ago in Austin and San Antonio. Or maybe they were so good I drank them before I could snap a photograph. I can’t remember now. Thankfully, the week is over, and for better and worse life will go on for my friends and hopefully, I’ll always be here to lend an ear. This recipe makes one drink. Feel free to double, triple, or even times the recipe to make as many margaritas as you’ll need. Then take your friends’ keys away because they’ll want more than one. 1. Place some salt on a small flat plate. Fill a shaker half way with ice. Set both aside. 2. Cut lime in half, then slice it down the middle of each half part way. Run the cut part of the lime around the edge of the glass and dip into the salt turning the glass back and forth a bit. Fill the glass with ice. 3. Squeeze as much juice out of lime as you can into the shaker. Add the tequila, Cointreau, simple syrup and cold water. Cover and shake. Strain into prepared glass and serve. I always find that certain events all appear to happen around the same time. It's weird really but it must be a law of nature or something along those lines. Your margarita looks delicious and definitely something to cheer you up! I need a margarita. That's it! I love how you shake them al la martini style. Brilliant. Well, as they say when it rains, it pours. So maybe you got all the bad out of the way for the whole month! Wouldn't that be great? These margaritas seem like the perfect way to kick off the weekend. Fresh squeezed and glorious. What a great friend! I'm glad all your friends are working it out. and I'm sure a margarita or two helps a little bit, just to relax a bit, you know? As for the creme brulees, they didn't turn out as well as I had hoped, I only used three egg yolks and they were kind of small too. They didn't set as well as I wanted. So I'm going to try them again this coming week. Thanks for sharing these recipes, they all look great! Some days are worse than others..Margarita is a perfect solution to forget all the problems.Love your blog!! It is beautiful.. colorful and absolutely gorgeous photography!! I like your word "horrorscope" :) I could use a margarita myself, after a long week of classes! Just found your blog and loving what I'm reading and seeing. That margarita looks mighty refreshing! Now following and hope you can stop by my blog too! 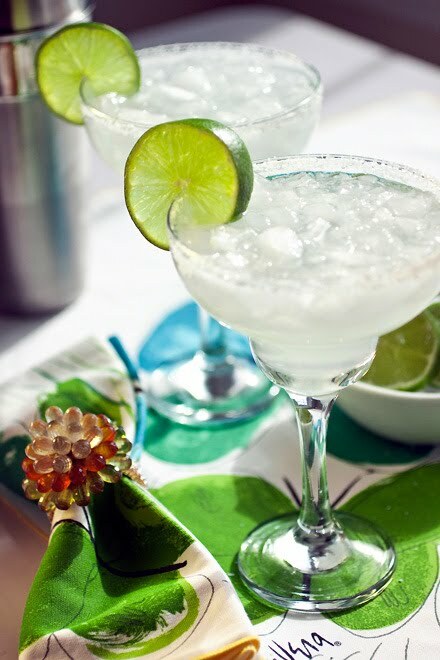 It may be noon but now you've got me craving margaritas! This looks amazing, Laura. So fresh and cool and perfect for sitting outside in the Texas heat... I'll be visiting Austin soon and am looking forward to enjoying a few fruity drinks myself! :) Thanks for sharing! You have a beautiful blog and I'm looking forward to exploring your recipes. oh wow, i'm a capricorn, too!! scary! this margarita looks like the perfect way to end a stressful week!